Instead, they will be put through to a telephone call centre, staffed by legal advisers - who are not qualified as lawyers. In London, most of the advisers will be former police officers. Spokesman for the London Criminal Courts Solicitors Association, Robert Brown, told Radio 4's Law in Action programme that the scheme was "call-centre justice on the cheap". The service, called Criminal Defence Services Direct is modelled on NHS Direct, and run by the Legal Services Commission (LSC). 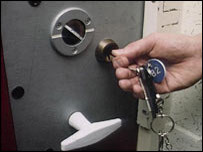 The commission has been operating CDS Direct for several years as a pilot scheme for people seeking publicly-funded advice in custody. Earlier this year they announced plans to expand the service to cover all requests for advice from people accused of minor crimes, such as drink driving or disorderly behaviour. Despite overwhelmingly negative responses to a consultation exercise, the commission decided to continue with its plans. From next month CDS Direct will cover police stations in Greater Manchester, the West Midlands and West Yorkshire. Then next February it will be expanded to all of England and Wales. Mr Brown says this goes directly against the principles of laws which are supposed to give suspects protection against police powers. "The Police and Criminal Evidence Act gives the state very wide-ranging powers over individual subjects. And the right was therefore enshrined in statute that people would have the right to an independent lawyer," he told the programme. "In the future they won't have a right to speak to a solicitor, only to an unqualified representative." However, the commission rejects the criticism. John Sirodcar of the LSC said that the advisers would all have undergone rigorous training to receive the Law Society's Police Station Qualification. This same qualification is required of lawyers working as duty solicitors. The CDS Direct scheme would, Mr Sirodcar said, save around £4m of public money which could be reinvested in Legal Aid. All the firms which won contracts to offer CDS Direct Services would be assessed and would have to meet a higher quality threshold than the minimum for offering criminal legal aid, he also said. To the horror of many defence lawyers, the contract for London has been won by a company which employs a large number of former police officers as advisors. "I don't think it's good for public confidence in the system when people that are detained in police stations are going to be referred in the majority of cases to speak to ex-police officers," Mr Brown said. "I think the majority of people are appalled." But Mr Sirodcar defended the choice, saying that many law firms had used the services of this same company and that it offered a good quality service. "There is a really good argument that says that somebody that understands police station work in its entirety and is then skilled and trained to become a legal adviser is a pretty good combination." Suspects will not be forced to use CDS Direct if, for example, they need interpreters or if they accuse the police of serious mistreatment. In those cases they would still be able to see a traditional duty solicitor. Law in Action is on Radio 4 on Tuesdays at 1600 or via the podcast at the programme website (see links on right hand side).